When was the last time you heard anyone mention the word circumspect or talk about having the fear of God? Why? There is a lack of concern for what God desires of us. We aren’t worried about walking circumspectly; we take our salvation for granted. What the old saints understood, that many today do not, is that God’s people are called to be circumspect. These saints valued the gift of salvation to the point that from their heart they walked carefully through this world. They understood that we have a worthy adversary who is seeking to destroy our souls on every hand (1 Peter 5:8). They realized, though people would say it didn’t take all of that, there is actually no such thing as too careful. By this definition you can see that to be circumspect is to exercise constant caution in our living. Let’s look at the Hebrew and Greek Definitions for this. If you would like to dig deeper into this word try here. See that you walk circumspectly – cautiously, prudently, attentively, warily, look narrowly [closely], accurately, diligently – not as fools, but as wise, redeeming the time, because the days are EVIL! Just for clarification, here are a couple more definitions to consider within this circumspection loop. Caution – Wary; watchful; careful to avoid evils; attentive to examine probable effects and consequences of measures, with a view to avoid danger or misfortune; prudent; circumspect. Prudent – Cautious; circumspect; practically wise; careful of the consequences of enterprises, measures or actions; cautious not to act when the end is of doubtful utility, or probably impracticable. Warily – Cautiously; with timorous [fearful of danger] prudence or wise foresight. Do you see it? Do you see how we are supposed to walk? Do you grasp why the old saints were so careful in their walk with God? They didn’t want to do anything that might displease God in any way shape or form. They lived their faith diligently, circumspectly. Today it seems many in the church are more concerned with “living it up” here on this earth. We want all the money, toys, and fun we can have and “still be saved.” We have taken our eyes off the prize. We have forgotten that we are pilgrims passing through this place, opting instead to pitch a tent and settle in for all the distractions this world has to offer. Truth be told, we have lost our fear of God. We must adjust our view of God. Is the God we claim to serve really THE GOD of the Bible? We are in a battle against the enemy of our soul. We need to live this life carefully, with our eyes wide open, keeping that in mind. We need to love the Lord, fear [respect] the Almighty God enough to examine everything we do, everything we allow, and everything we think in the light of His Word. We are living in a world saturated with evil. 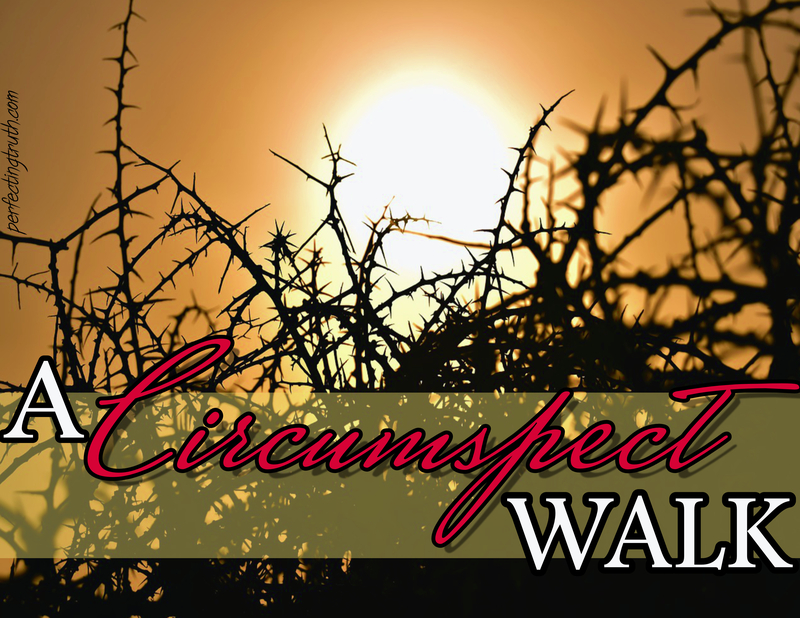 In order to remain unspotted from the world (James 1:27) we have to live circumspectly; there is truly no way around this. *Maintain a truly repentant heart: We don’t get it right all the time. Sometimes we miss the mark, and we should repent quickly and honestly. Everything you said is absolutely right!!! and that one thing is called faith!! I know people right now who are trying their best to walk circumspect and they appear (to me) to be doing a pretty good job, but these same people do not live their lives by faith, which means they do not have the one thing that Christ is looking for. That is what I remember about the church world years ago. Today… we see people trying their best to live their lives by faith but these same people don’t live clean and separated lives. They look like “anything goes” in their walk with Christ, which means they do not have the one thing that Christ is looking for. That is what I recognize about the church world of today. Real Faith causes obedience to God’s Word. Real Faith causes blessings to be abundant in life. Real Faith causes a total difference from all of the world AND most of the church. Real Faith ; NOTHING ELSE can cause us to live an eternal life with Christ…. Luke 18:8 when the Son of man cometh, shall He find FAITH on the earth? Romans 1:17 for therein is the righteousness of God revealed from FAITH to FAITH. Habakkuk 2:4 the just shall live by his FAITH. Hebrew 10:38 now the just shall live by FAITH. Romans 1:17 the just shall live by FAITH. Romans 3:28 a man is justified by FAITH without the deeds of the law. as much as we possibly can . . . but without FAITH . . . . We won’t see the kingdom! I could actually reprint this as a blog post :D.
If we are going to walk circumspectly then faith we must have and develop. Failure to do so is actually failure to walk circumspectly. Faith is an all encompassing thing for true believers. I am learning that it actually brings balance. Everything is so mixed up today, just as you have explained here. Sometimes I think about how the Lord will come back for a church without spot or wrinkle. Faithlessness IS a spot/wrinkle, since without faith it is impossible to please the Lord (Heb 11:6a). We don’t often make that association but it’s true. I think faith is lacking due to much worldliness; having one’s belief system shaped by the world’s instruction. Growing up I don’t think most, in my circle anyway, were able to actually explain what faith is…other than the surface. These days it often seems “faith,” for many, is strickly for earthly, flesh satisfying matters — not faith to walk circumspectly; therefore, we have christians who literally don’t see anything wrong with anything. Sad state of affairs. BUT if we will go back to those saints who came before (and I mean BACK…those from beyond our time), they have much instruction and encouragement to impart regarding how to live by faith AND walk circumspectly so that we can be a part of the church without spot or wrinkle that Christ is looking for.